This ELH Challenge asked the eLearning community to show how interactive charts and graphs can be used in online training. We could share a static example of charts and graphs or we could create something more interactive to show and compare data. This is an age-old question and remains a challenging one to answer. There are various models and their interpretation can be subjective. The question has even been discussed in the Articulate forums. Two prominent studies have taken place on this subject. One from ATD and another from the Chapman Alliance. I have used the figures for calculating development time from the Chapman Alliance study for this challenge. I selected an image and colour to create icons for each category. The selection screen contains the four categories. Each category contains a description and the learner has to drag the calculator to the relevant type of learning to be developed. The calculator changes in appearance when the learner hovers over each category. This is achieved using state changes to the calculator image. When the learner drops the calculator onto a category, a variable is set that will display the graph with the relevant figures. The graph is interactive. The learner can view how long other types of learning take to create using the category icons at the bottom of the graph. 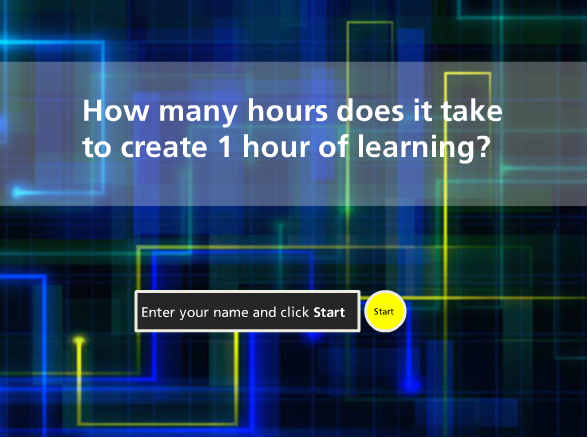 Click below for the interactive graph showing how many hours it takes to develop learning.